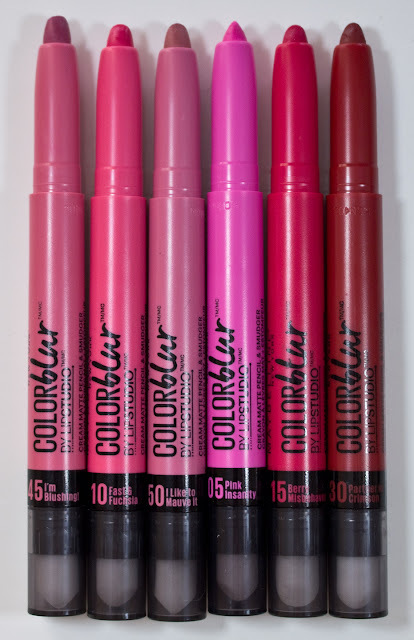 The Maybelline Lip Studio Color Blur's retail for $8.99US or $9.99CAN to $12.99CAN for 0.04 oz. of product. Maybelline Lip Studio Color Blur rubber tip and twist up dial. Maybelline Lip Studio Color Blur in back of packaging and no ingredients list. Dimethicone, Isononyl Isononanoate, Silica, Pentaerythrityl Tetraisostearate, Isododecane, Polyethylene, Dimethicone Crosspolymer, BHT, Alumina, Synthetic Fluorphlogopite, Calcium Sodium Borosilicate, Tocopherol, Calcium Aluminum Borosilicate, Tin Oxide. May Contain: CI 77891 / Titanium Dioxide, CI 15850 / Red 7 Lake, CI 45410 / Red 28 Lake, CI 19140 / Yellow 5 Lake, CI 77491, CI 77492, CI 77499 / Iron Oxides, CI 15850 / Red 6, Mica, CI 75470 / Carmine, CI 77163 / Bismuth Oxychloride, CI 45380 / Red 21, CI 77742 / Manganese Violet, CI 77400 / Bronze Powder, CI 77400 / Copper Powder, CI 45410 / Red 27 Lake, CI 42090 / Blue 1 Lake, CI 47005 / Yellow 10 Lake. The Studio Color Blur formula is interesting. Because the pencils apply to cream but dry down to a soft powder on the lips they wear for a long time on there one. The formula is gel base but there feel lighter than most gel pencils as well. The texture feel soft but not too drying on the lips. These also sheer out nicely on the lips as well which gives you that soft Korean petal colour look to the lips. 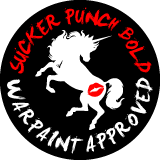 It also means you can sheer it down to almost just a stain on the lips without if fading too quickly. 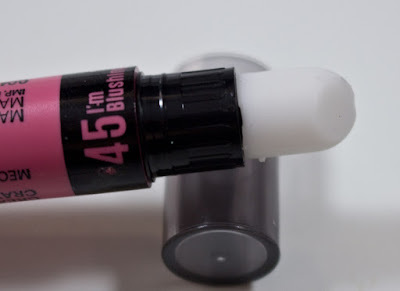 45 I'm Blushing is bright rose pink that leans a bit more warmer. 10 Fast & Fuchsia is a vibrant hot pink. This shade was a little powdery on the lips. 50 I like to Mauve it is a warm beige/pink. 05 Pink Insanity is a vibrant also neon blue based pink. This shade was a little powdery on the lips. 15 Berry Misbehaved is a right berry pink with a strong magenta undertone. It still reads more red than magenta which makes it slightly more unique. 30 Partner in Crimson is a deep cool base red. Wear: Close to 6 to 8 hours wear for this before the shade fades down to a subtle tint. Is a long bottom twist up pencil, with a slightly rubber end to smudge the product. The tubes are super lightweight. These are unique because of the silicone family formula, they all make good lip liners and matte lip colours. These are surprisingly bright when fully applied but they are versatile because you can sheer them out so easily too. I love Fast & Fuschia and wear it under other colors sometimes but usually on it's own. I want more of these!